You can view survey results at any time. Survey results take on an entirely new dimension with the intuitive and feature-rich capabilities of SurveyGold. 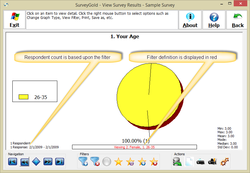 Defined filtered views of survey results based on any responses given or date ranges or both. Drill-down for progressive detail. Display results in colorful 2D and 3D graphs. 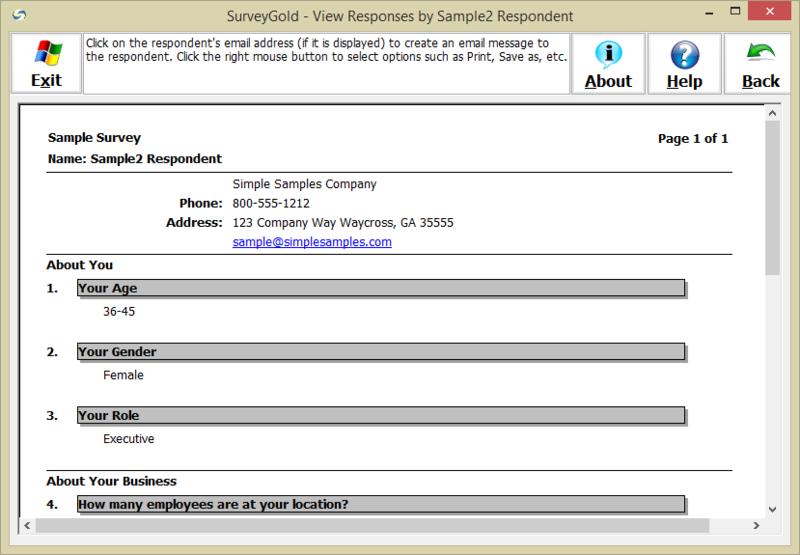 The View Results tab makes it possible to take control of how you look at your survey responses. 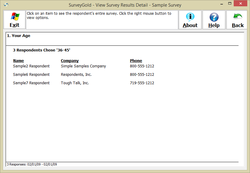 The View Results tab provides access to survey results. The initial view of the survey results is a high-level summary including the number of respondents, response date ranges and survey description the currently selected survey. From this point you can see progressively more and more detail as you select questions and view responses. 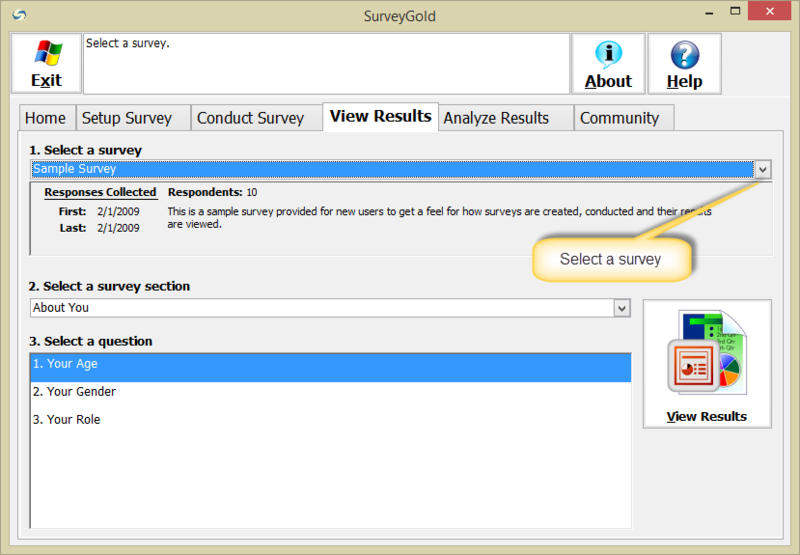 Step 1 - Select your survey from the Select a survey prompt. 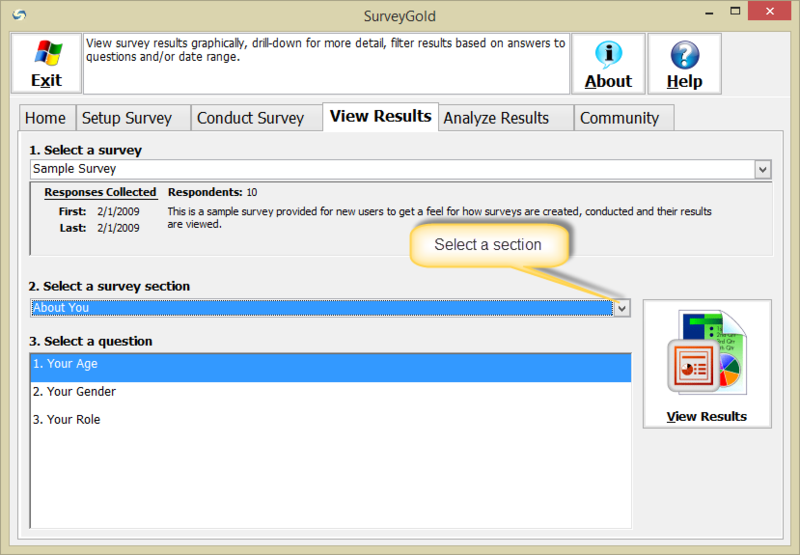 Step 2 - Select a survey section from the Select a section prompt. Note: The first section is automatically selected when you select a survey. The first question in the selected section is automatically selected when the section is selected. You may select a question to view in one of several ways in the results viewer. The method you choose depends upon which screen is currently displayed. Begin viewing your survey results by selecting a question from the View Results tab. Step 1 - Select your question from the Select a question prompt and select View Results. 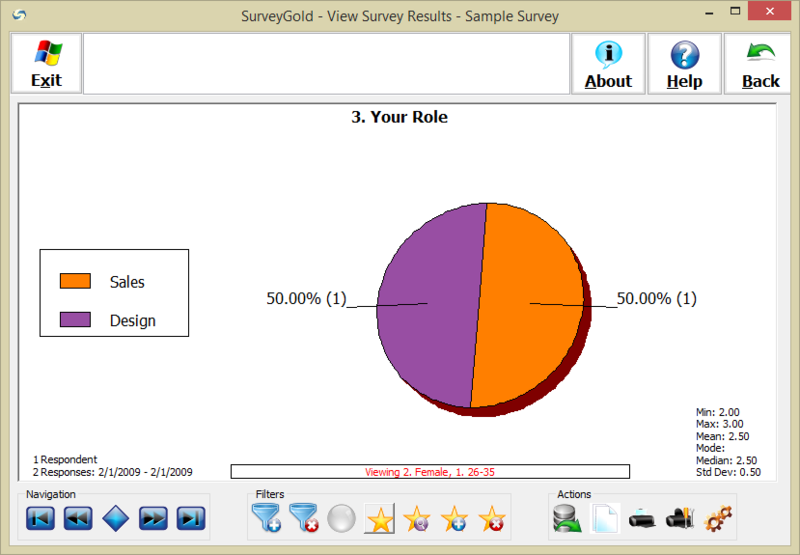 The results of the selected question is then displayed in the viewer. Once the responses to a question are displayed, you may select Next Question to view the responses to the next survey question. Conversely, if you are viewing a question other than the first question in the survey, you may select Previous Question to view the responses to the previous question. Tip: Use your keyboard to quickly navigate questions using the keyboard equivalents. Note: The buttons navigate to questions without regard to section breaks. For example, if the question you are viewing is the last question in a section, select Next Question to navigate to the first question of the next section. Once the responses to a question are displayed, you may quickly navigate to a specific question without having to traverse other questions. Step 1 - While viewing the results of a question, select Select Question. This causes the question title and the question selection slider to appear. Step 2 - Drag the question selection slider from the current question to the desired question. The question title changes as the slider moves from question to question. 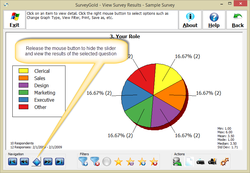 Step 3 - Release the mouse button to view the results of the selected question. After selecting a question, the results to the question appear as a set of responses. You can perform a variety of actions while viewing responses. 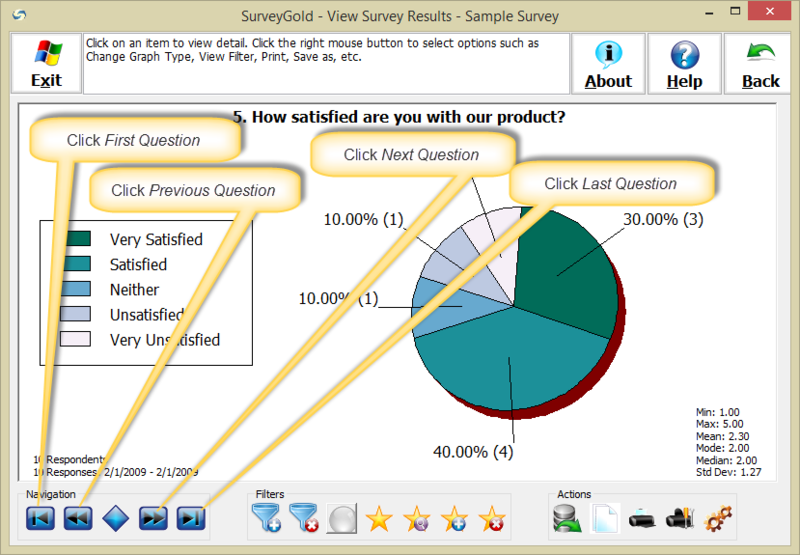 Survey responses results are displayed as either a graph or as a list. It depends upon whether or not the survey author defined the question with response choices from which the respondent selected a response. Questions with response choices are displayed in a graphical format. Responses provided by respondents are grouped into graph segments. Each graph segment represents the number of occurrences of a particular response choice. For other actions, refer to related topics in this section of the user guide. Questions without response choices are displayed in a tabular list. Each response is displayed in a separate detail line in the list. Any response that has associated comments is displayed as a note (a paper clip and a yellow scrap of paper). Step 1 - To view comments, simply position your mouse pointer over the note. The comments will popup in a small window until you move the mouse away from the note. Step 2 - To view all of the comments provided by the respondents, right-click anywhere in the window and select Display All Notes from the popup menu. The response list is replaced with a list of all responses. The example has only one comment. However, had multiple respondents provided comments, all comments made would be shown in the list. Responses without comments simply show up in this list as a dot followed by a blank line. Step 3 - To return to the list of responses, right-click anywhere in the window and deselect the menu item View All Notes from the popup menu. 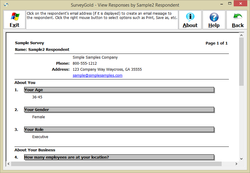 While graphs and lists provide a nice high-level view of responses, SurveyGold drills down to reveal more detail by simply selecting a response in a list or a graph segment. Step 1 - To view a list of respondents who provided a particular response, select the graph segment (e.g., pie slice, bar, etc.) or list item. This displays a list of respondents who provided that response. To return to the response summary level, select Back in the tool bar. The lowest level of survey response detail is accessed by selecting a respondent in the list of respondents. 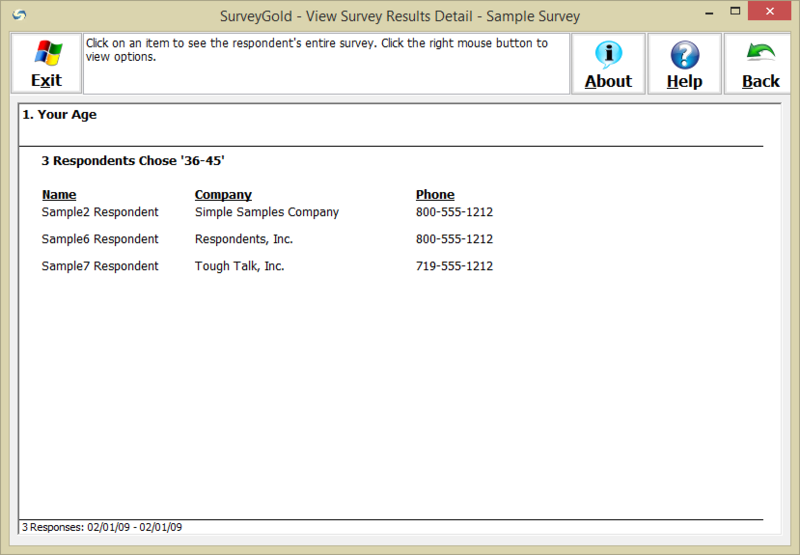 Step 1 - Select a respondent row in the list of respondents to see that respondent's completed survey. This may printed out for further evaluation or for use in follow-up contacts with the respondent. To return to the list of respondents, select Back in the tool bar. The results viewer provides powerful data manipulation capabilities by right-clicking on the response summary item (e.g., pie slice, bar, line, tabular list item) of any question. To view the responses for a subset of respondents (e.g., females of a certain age group who work for a certain sized company) simple right-click on those responses while viewing the results. This causes all other question responses to be viewed through the filtered set of respondents. SurveyGold provides the ability to quickly and easily view results using a subset of respondents. 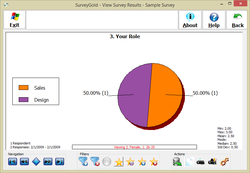 This subset of respondents displayed in the view is based upon a defined filter. The filter can be defined as particular responses to particular questions, a response date range or a combination thereof. Once a filter is defined, the results viewed by navigating to different questions or performing actions in the Analyze Results tab are based upon the defined filter. By way of example, we will use the Sample survey to view responses provided by females whose age is 26-35. While this example only includes two filter criteria (age and gender), there is no limit to the number of filter criteria that you can apply. You can filter on any response to any question. This provides the framework for very powerful survey response analysis. Step 1 - While viewing results of the Gender question, right-click on the "Female" response item or legend item and select "View Only 'Female' Survey Results" from the popup menu. Note: You can optionally exclude respondents based on responses by holding down the Shift key before right-clicking on a pie slice. Note: You can optionally filter responses based on the date of response by right-clicking anywhere selecting "View By Date of Response" from the popup menu. The result of this action is a filtered view. The Gender question responses displayed are limited to only the female respondents. Note: After the filter was applied, the number of responses (shown in the lower left corner) was reduced from 10 to 6. Also the small red text at the bottom of the response screen denoting the filter that is currently applied. It denotes the filter as the question number (abbreviated as 2, the second question) followed by the response to that question. Step 2 - Navigate to the Age question, right-click on the "26-35" response item or legend item and select "View Only '26-35' Survey Results" from the popup menu. The result of this action is a more refined filtered view. The Age question responses displayed are limited to female respondents whose age is 26-35. Note: After the filter was applied, the number of responses (shown in the lower left corner) was reduced from 6 to 1. Also the small red text at the bottom of the response screen denoting the filter that is currently applied. Step 3 - Navigate to another question to see the responses based on the filter. Select Analyze Results using Filter View to perform actions in the Analyze Results tab using the filtered set of respondents. While you are viewing a filtered set of survey results, you can have SurveyGold memorize the filter for later use. The value to this feature is that provides quick and easy access to filters that you routinely apply when viewing you survey results. It also sets the stage for viewing results in multiple series, which will be covered in few topics from now. 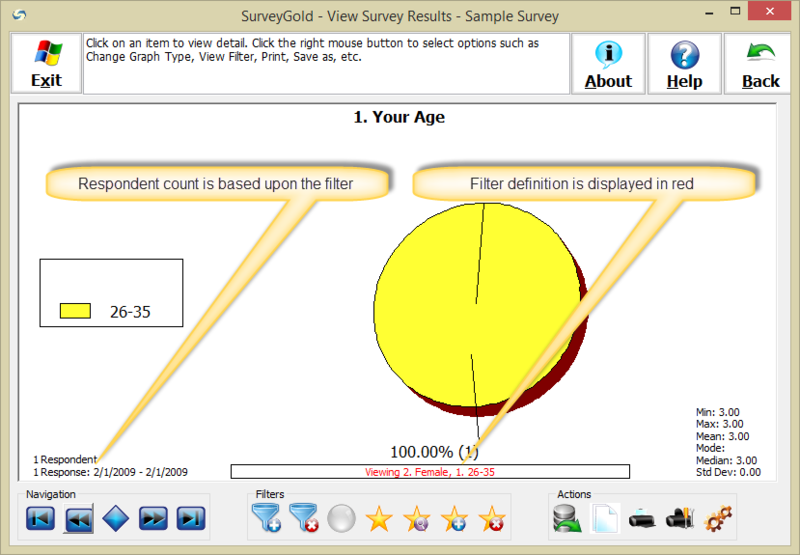 In this example we will memorize the filter for female respondents with an age of 26-35 years old. Step 1 - While the filter is applied, select Memorize the Current Filter in the button bar. 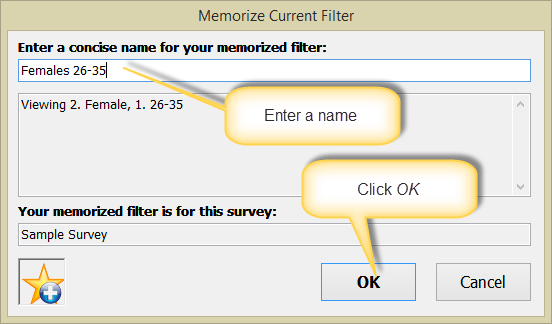 Step 2 - When the Memorize Current Filter window appears, enter a name for the filter and select​ OK.
Each memorized filter name must be unique within a survey. 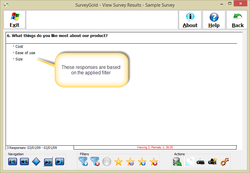 SurveyGold automatically creates a filter name for you that is based on the current filter. 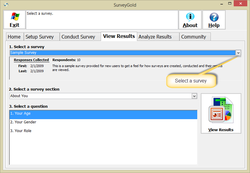 You can either accept the name the SurveyGold creates, or you can change it to a name that is more to your liking so long as it is a unique name within the survey. In our example, we name the filter "Females 26-35". 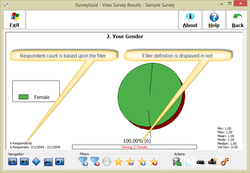 You can apply a memorized filter when viewing your survey results at any time that a filter is not currently applied. The value to this feature is that provides quick and easy access to filters that you routinely apply when viewing you survey results. 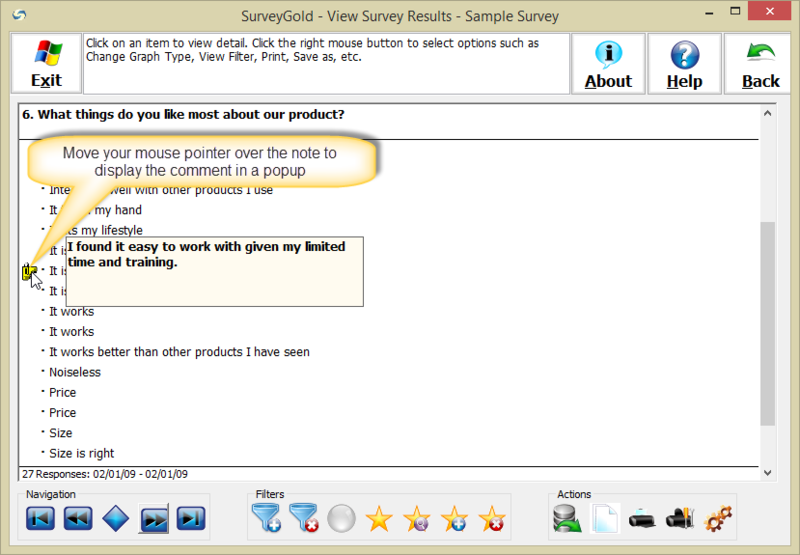 Step 1 - While viewing any question in the survey, select Apply a Memorized Filter in the button bar. 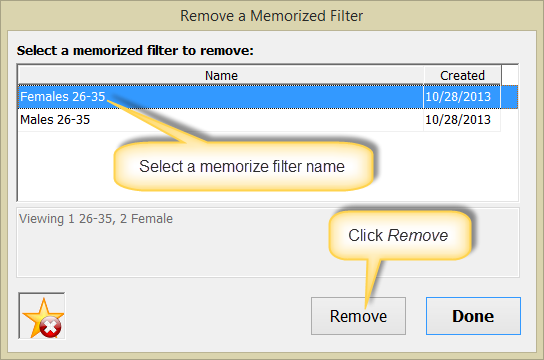 Step 2 - When the Apply a Memorized Filter window appears, select a memorized filter and select OK. Step 3 - The result of this action is a more refined filtered view. 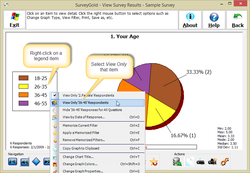 The displayed question responses displayed are limited to male respondents whose age is 26-35. Navigate to another question to see the responses based on the filter. 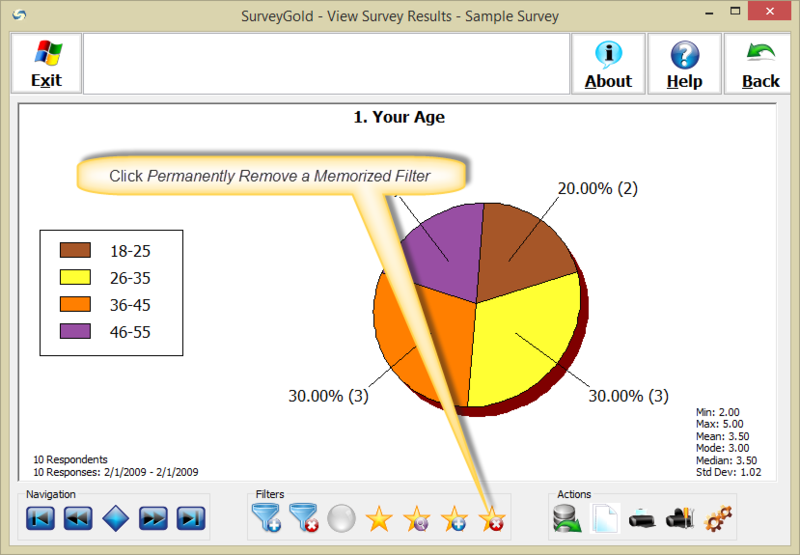 SurveyGold provides the ability to remove a memorized filter. 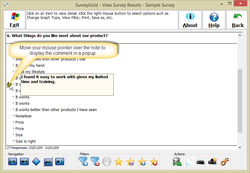 Step 1 - While viewing any question in the survey, select Permanently Remove a Memorized Filter in the button bar. 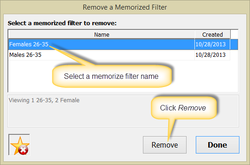 Step 2 - When the Remove a Memorized Filter window appears, select a memorized filter and select OK. Select Done when you have removed all desired memorized filters. This powerful feature leverages the memorized filter feature of View Results by providing the ability to display multiple sets of responses (side-by-side in multiple graph series) for the survey results you are viewing. The value of this feature is that it provides the ability to show trends of previous period to current period, comparisons of demographic groups, etc. The results of these types of surveys are often measured against another “baseline” set of results. The baseline is typically a subset of responses to the survey that are used as a basis for comparison of current results. The subset of responses may be from a prior period (e.g., prior quarter, year to date, last year, etc.) or may be from a segment of the respondent population based on a demographic trait (e.g., business unit or division, job grade, tenure, etc.) or a response to a particular question…or a combination of period, demographic or question response. 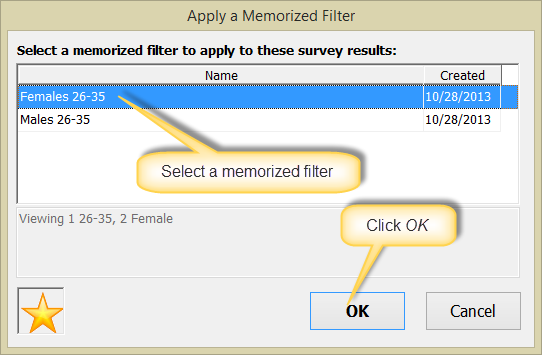 Note: You must have at least two memorized filters for your survey in order for this feature to be enabled while viewing your survey results. Also, it is possible to display any number of series, limited only by your imagination and your practical business need. 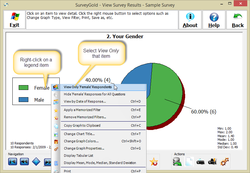 The following example shows how to create a comparison of female and male respondents. 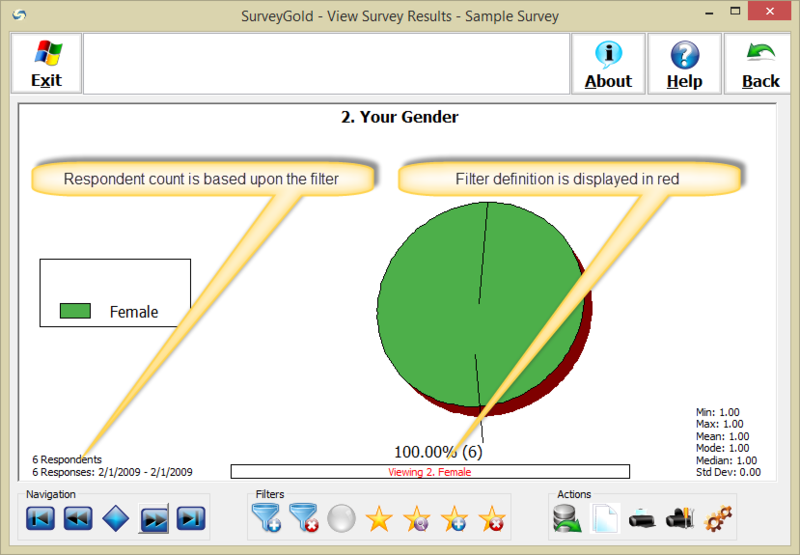 It assumes that you have already created two memorized filters, one for male respondents and one for female respondents. Step 1 - While viewing any question of your survey results and when a filter is not applied, select View Series using Memorized Filter in the button bar. Step 2 - When the Create Series using Memorized Filter window appears, select two or more memorized filters to display and select​ OK. In our example, we will apply the memorized filters "Female" and "Male". Step 3 - The result of this action is that the previously displayed graph now has a legend item for each series and a list box for each series item appears above the graph. Select a list box item for the desired series, such as "Female". The resulting graph displays the filtered view. Navigate to another question to see the responses based on the series. Select Analyze Results using Series View to perform actions in the Analyze Results tab using the filtered set of respondents in series. When viewing a graph, when the mouse moves over a particular graph segment the enumeration value of that response is displayed . The enumeration value is the position of a response in the set of choices for a particular question. This value is used to determine the mean, mode, median and standard deviation for the responses. Please select your favorite flavor of ice cream. In this question, the choice "Chocolate" has an enumeration value of 1, because it is the first choice in the set. "Vanilla" has an enumeration value of 2, because it is the second choice in the set. "Strawberry" has an enumeration value of 3 because it is the third choice in the set. When viewing a graph for a non-ranking question, statistical calculations based on the enumeration values can be displayed in the lower right-hand side of the graph by right-clicking a selecting Display Mean, Mode, Median and Standard Deviation from the popup menu. This calculations are the mean, mode, median, minimum, maximum and standard deviation based on the enumeration value for the question responses in the current view. If you prefer to not see these statistical calculations, simply right-click and unselect Display Mean, Mode, Median and Standard Deviation from the popup menu. You may print anything displayed in the results viewer. Step 1 -When a graph or list is displayed in the viewer, right-click anywhere in the window and select Print from the popup menu. Note: You can specify printer preference by right-clicking and selecting Print Setup from the popup menu. Note: You can print in the same way when viewing drill-down details. Note: This feature saves only the displayed responses to a file. If you want to save the entire set of survey responses for all questions to a file, that feature is enabled from the Analyze Results tab using the action "Convert Responses". Step 1 - When a graph or list is displayed in the viewer, select Save As from the button bar. Step 2 - When the Save As window appears, locate the Save as type field and select a file type. Step 3 - Enter a name for the file you want to create in the File name field and select Save. Windows Metafile Graphical image Suitable for including in a web page, word processing document, or other publishing software. Also suitable for use with image editing software. XML Extensible Markup Language Suitable for including in a web page, word processing document, or other publishing software. XSL-FO Extensible Stylesheet Language Formatting Objects An XML-based markup language describing the formatting of XML data for output to screen, paper or other media.